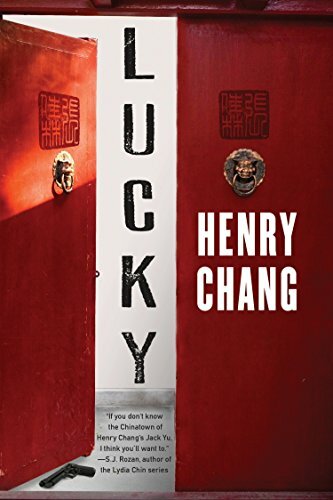 Henry Chang’s crime novel Lucky marks the fifth appearance of New York Police Department Detective Jack Yu. Set in Chinatown and surrounding Manhattan, the series began with Chinatown Beat, in which Jack investigated the murder of a Triad elder. Struggling in this debut novel with the recent death of his father, Jack met Alexandra Lee-Chow, an attractive attorney with the Asian American Justice Advocacy, he consulted an elderly fortune teller for clues from the spirit world, and he set up clandestine meetings for more down-to-earth intelligence from his boyhood friend, Tat “Lucky” Louie, a leader of the Ghost Legion street gang. These characters accompany Jack through the next three novels in the series, Year of the Dog, Red Jade, and Death Money. He began a relationship with Alex, who was going through a messy divorce; he brought more crime scene evidence to Ah Por, who provided him with cryptic key words that inevitably related to the solution of the crime; and he continuously worried about Lucky, who was gunned down outside a Chinatown off-track betting establishment and ended up in a coma in Downtown Hospital. Which brings us to Lucky, the fifth novel in the series. Taking place only a few months after the events of Death Money, Chang’s new novel finds Jack Yu still working through the repercussions of the previous story’s experiences. Alex temporarily broke off their relationship because of her estranged husband’s dirty tricks, and Jack is still dealing with the anxiety this separation causes him. He’s also consulting an NYPD therapist in a department-mandated attempt to address any aftereffects from the shootings and other events occurring in earlier novels. Meanwhile, after 88 days in a coma, Lucky Louie wakes up and leaves the hospital. Having heard much of the bedside discussion among his visiting Ghost Legion brothers about how they will carve up his territory among themselves, Lucky embarks on a violent campaign with a new crew to assault Ghost Legion holdings and exact his revenge. Following Lucky’s trail of destruction, Jack attempts to talk his old friend into witness protection in order to make the most of his second chance at life, but Lucky seems determined to follow through on his violent and deadly course of action. As a whole, the Detective Jack Yu series is a terrific example of noir crime fiction with a unique cultural perspective, but Lucky is a disappointment. Where the previous novels kept Jack at the center of our attention as he worked through the primary investigation of the story, in Lucky he’s either mired in a rehashing of the recent past with the therapist—old ground we’d rather not slog through again—or else following ineffectually in his friend’s destructive wake. Most of the novel’s action features Lucky Louie and his single-minded attempt to wreak havoc on Chinatown’s organized crime establishment. While Lucky was a somewhat interesting secondary character in previous novels, he’s not deep enough or engaging enough to carry this novel on his back. As a result, Lucky comes across as straight noir that is more focused on gang violence and mayhem than anything else. The magic of the previous novels is missing. The sprinkling of Cantonese expressions and cultural insights into the spirit world, ancestors, and Chinese fast food fail to charm as they did in earlier novels. Chang’s secondary characters, most notably Ah Por and Jack’s friend Billy Bow, the Tofu King, are either lifeless walk-ons or entirely absent. Most importantly, though, the reader waits in vain for Jack Yu to take his next big step forward as a developing series protagonist. Jack pulled away, watching the dark Chevy Impala in his rearview. It was banging a U-turn into traffic to get on his tail. Lucky lounged across the backseat, grinning. “Give me your phone,” he demanded. “Where are we going?” The Impala in the side-view now, four cars back. “Just like old times,” he repeated, looking out the back window, welcoming the challenge. “Go right on Park Row.” The tail jockeying in the rearview again. “Straight to East Broadway. Give me the phone.” Jack tossed it to him, gritting his teeth as the Mustang bit into the blacktop. He knew these backstreets by memory, having done this before in their younger years. Back then it was joyriding. While a new Detective Jack Yu novel is always greeted with excitement and anticipation, Lucky must be read in the context of the series as a whole in order to appreciate what Henry Chang is trying to accomplish in it. On its own, unfortunately, it fails to punch above its weight.